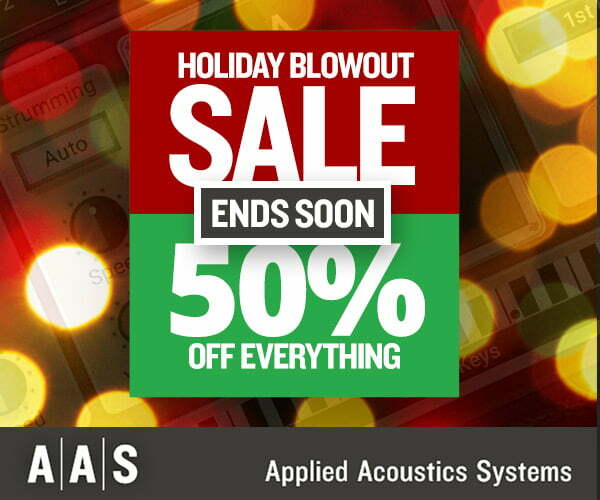 Applied Acoustics Systems has announced that there are just a few days left in its Holiday Blowout Sale, in which you can purchase all synthesizer instruments, effect plugins, sound packs and bundles (incl. upgrades) at a 50% discount. Just a quick message to let you know that there are only five (5) days left to our special holiday promotion.Until Monday, January 21, get 50% off and more on all orders from our web store. Our best offers are on the Modeling Collection Upgrades—whether you already own one or more Professional Series instruments, they represent exceptional value. The sale also includes the recent String Studio VS-3 synthesizer and new Hoversound pack for Chromaphone 2 and AAS Player.